"We Stand Behind Our Erections"
Thomas Phoenix International is a premier pre-engineered metal building erection company consistently outperforming today's safety and quality standards. Gary T. Smith conducting an in-house safety meeting. From nuclear power plants to big pharmaceutical companies, TPI trains all employees rigorously to meet the highest safety protocol and project requirements. Besides 10 and 30 hour OSHA certs, our employees are trained in cutting edge safety and fall protection systems. Welding, rigging, aerial lifts, telehandlers... our crews are trained and certified. Our nationally-recognized Apprenticeship program is a trailblazing asset. In conjunction with the Metal Buildings Institute, crews are classroom and field trained in all aspects of pre-engineered building systems, from the anchor bolts to trims, and everything in between. 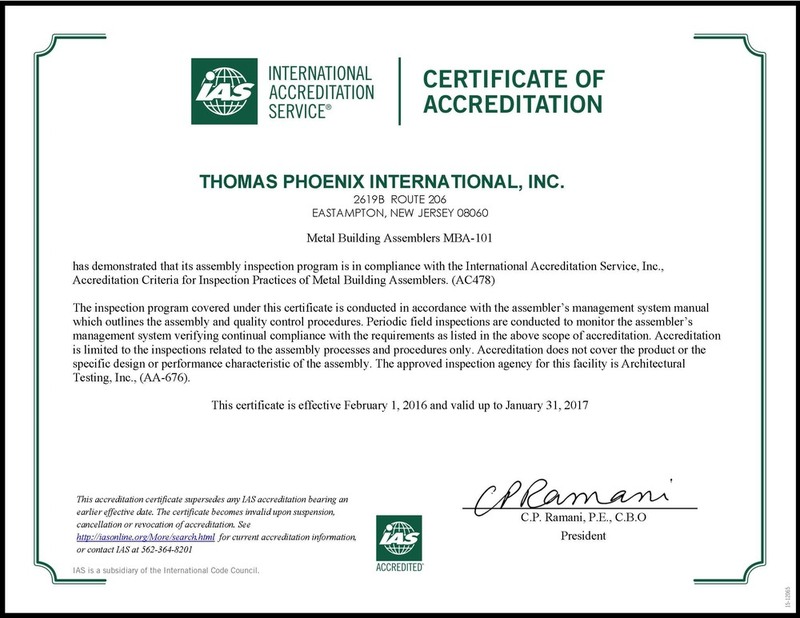 As part of our effort to raise industry standards for Quality Control, Thomas Phoenix is proud to be a pioneer in achieving the new IAS AC-478 standard for metal building assembly. This standard sets the bar for all erectors to meet strict QC and inspection criteria. This hangar required significant pre-planning to complete successfully. The main hangar had 266’ of clear-span rafters along six lines of the primary steel. A previous erection company suffered a catastrophic collapse due to lack of temporary bracing during the erection phase of the primary steel. Our planning determined that modular erection was a safer alternative to stick- built. However, the FAA approved only a 120’ crane boom tip height, which effectively ruled out the extra rigging that using a spreader bar would have required. To complicate matters, the site had only 15’ available around the entire hangar perimeter, (on one side of which was an active tarmac), so the entire structure had to be staged and erected practically within its own footprint. We made detailed 3d models in order to illustrate our plan to the building owners and engineers for approval, along with an extensive temporary bracing plan. Four 133’ long modules weighing nearly 90,000 lbs each were constructed on the ground and then flown into position in pairs, connected at each end and the peak simultaneously. The actual modular lift in progress. The House of Sports project netted Thomas Phoenix the 2013 MBCEA Building of the Year award in addition to the 2013 Award of Excellence in the Recreational category. TPI added a third-floor pre-engineered indoor sports facility onto an existing 40' tall structure, then completed all-new cladding on roof and walls. In 2012, Thomas Phoenix was hired to build a large-scale warehouse utilizing pre-engineered framing and roofing with precast walls. Anticipating the construction of the Baha Mar resort, the Bahamian government constructed this new "inland" customs facility to receive shipments, renovate Arawak Cay, and improve the views from both the Baha Mar and Paradise Island Resorts. Offices and Loading Docks of Nassau Inland Container Terminal.